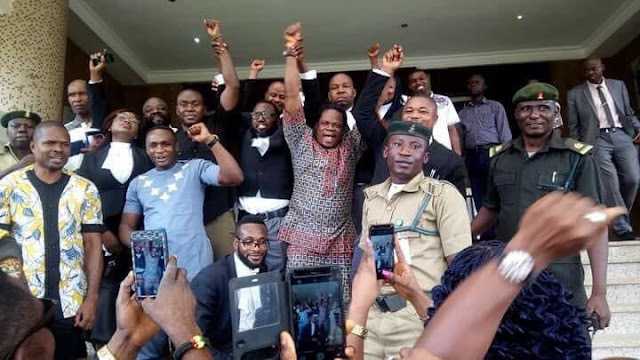 The Indigenous People of Biafra, IPOB, has raised the alarm over a fresh plot by agents of the federal government to allegedly re-arrest four of its members who were recently granted bail after three years of being in prison. The group said it has uncovered a plot by the military to invade the South-east and some part of South-south again, adding that part of the plan would be to re-arrest its members who were recently granted bail by the Justice Binta Nyako-led court in Abuja. A press release by the media and publicity secretary of the group, Mr Emma Powerful, which was made available to our news desk in Awka, alleged that the move was geared towards intimidating the people out of pressing for the release of their leader, Nnamdi Kanu, who they claimed was whisked away by security operatives on 14 September 2017, after invading his house. The quartet of Benjamin Madubugwu, Bright Chimezie, David Nwawuisi and Chidiebere Onwudiwe had recently secured bail more than one year after their co-defendant, Nnamdi Kanu was granted bail by the same court. Powerful further stated that “We continue to demand that the military produces Nnamdi Kanu wherever he is being kept. The federal government of Nigeria is yet to formally respond to numerous queries from the British government demanding an explanation on the whereabouts of their citizen. “The Nigerian army’s involvement in the invasion and massacre of defenceless and unarmed members of IPOB present in Afaraukwu on that fateful day of 14 September 2017 is the irreducible and constant critical point of reference in any discussions regarding the whereabouts of Mazi Nnamdi Kanu.